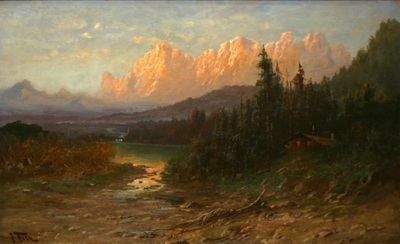 Born in Austria, John Fery earned a strong reputation for dramatic paintings of western mountain landscape in the United States. 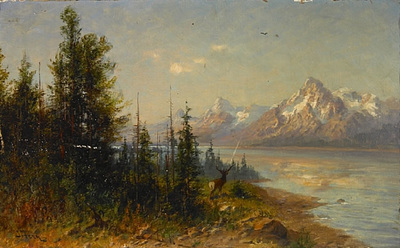 Glacier National Park in northwest Montana was a popular subject for him. He was raised in a prominent, wealthy family that lived on an estate about nineteen miles northeast of Salzburg. His mother was Hungarian, and his father was born in Bohemia. 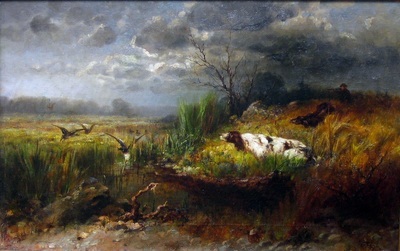 S ome sources have written that he studied art in Dusseldorf, Germany with Peter Jansen, and also in Munich, Venice and Karlsruhe. But his "name does not appear in the records of the major art schools in any of these places, nor is there any record of his name at either the Vienna or Budapest academies." (Merrill 26) It is possible, however, that he received private instruction, and because of the sophistication of his painting, sources think it unlikely that he was self taught. 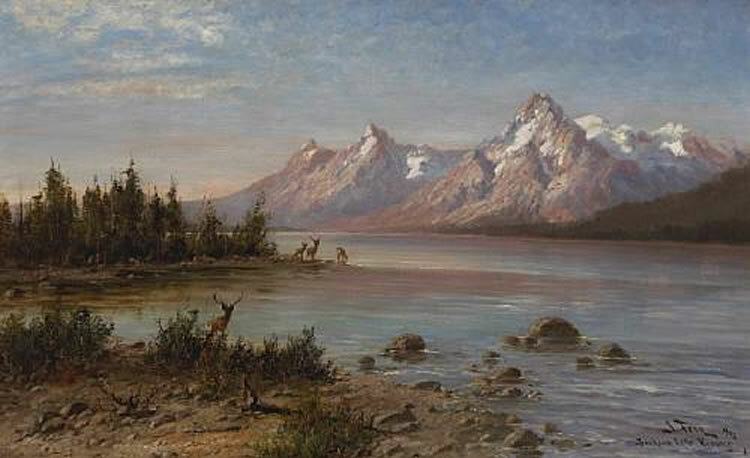 An early interest in wilderness scenery led him to painting American landscapes and hunting scenes. In the mid 1880s, he came to America and lived in the German community in Milwaukee, and then in 1886, brought his family to the United States. His wife, Mary Rose Kraemer (1862-1940), was born in Switzerland, and they had one child born near Munich and two others born in the United States. 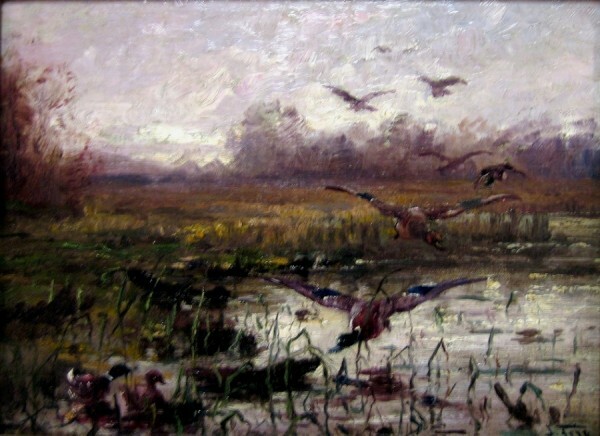 From 1886 to 1888, they lived in New York, and by 1890, Fery had made his first trip West. He visited Yellowstone Park in 1891, and indicated in his writings that he had been there even earlier. 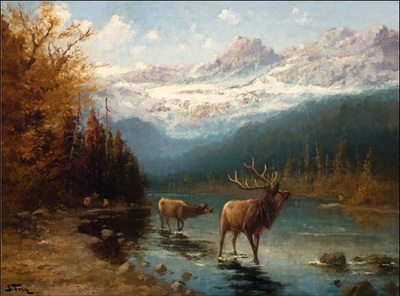 From 1892 to 1893, he led European nobility on hunting expeditions to the American Northwest, made possible by the completion of the Northern Pacific Railroad. The group's itinerary included Lake Michigan, Arizona with the Grand Canyon, New Mexico, California, Oregon and Wyoming. 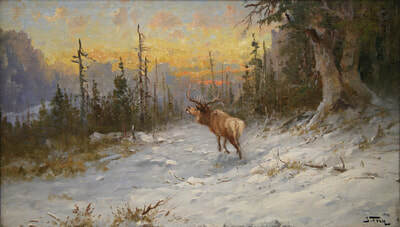 In 1895, he led a second expedition, and these ventures launched his career as a painter of the American West. 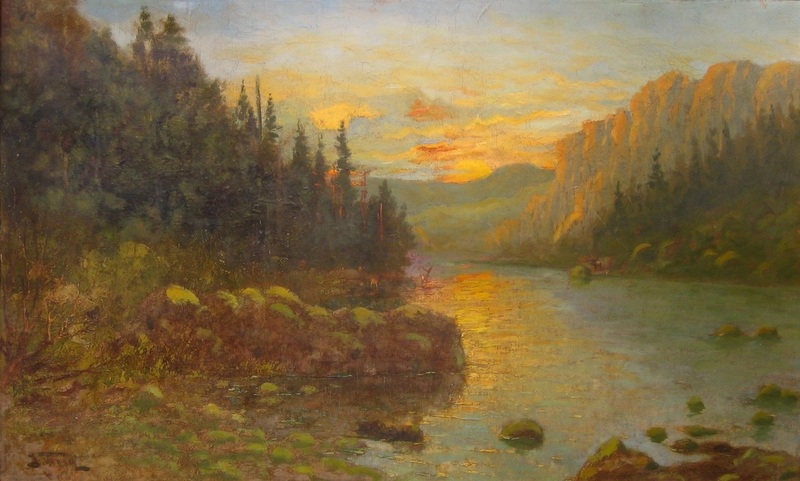 During the late 1890s, he lived with his family in a cabin near Jackson Lake, Wyoming, but by 1900 was in Duluth, Minnesota, where he and Austrian-born painter Feodor von Luerzer painted mural decorations for the Fitger Brewery tap room. (In 1914, the murals were moved to the Pickwick Restaurant in Duluth, where they remained for many years). By 1903, Fery was in Milwaukee where he stayed until 1911, when he moved to St. Paul, Minnesota until 1918. His greatest patron became Louis Hill, owner of the Great Northern Railway and a resident of St. Paul. Hill commissioned Fery to paint scenes of Glacier Park and other scenic landscapes for placement in their hotels and railroad stations. 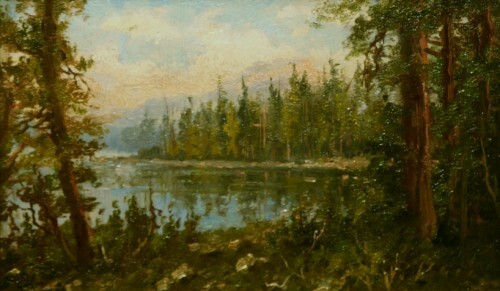 Over the years the Railroad purchased a total of 362 works, and many of these paintings were large-scale, panoramas. 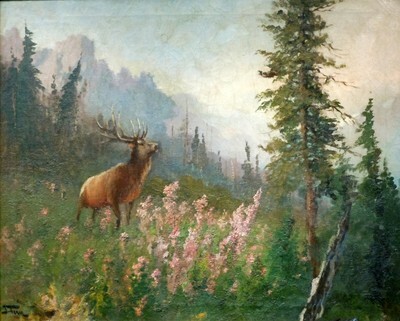 In 1914, after several years of painting in Glacier Park, Fery did a series of about twelve oil paintings of Yellowstone for advertising purposes for the Northern Pacific Railroad. Itinerant, Fery seems never to have settled in one place for very long. From 1919 to 1923, he was living in Salt Lake City, Utah where he painted many landscapes, especially of Zion Canyon. Then he returned to Milwaukee until 1929, when he moved to Orcas Island near Bellingham, Washington. That same year a fire took all his possessions including thousands of sketches and many paintings. After that he moved to Everett, Washington where he died five years later. 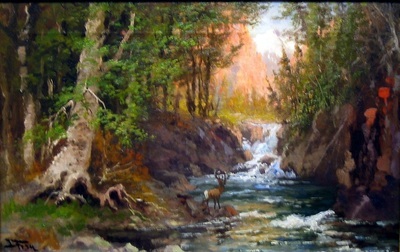 About 150 of his paintings have been found after his death, and the largest group are of Glacier National Park, but some are from California, Arizona and New Mexico and Wisconsin. One is from Venice, Italy and one from Bavaria. 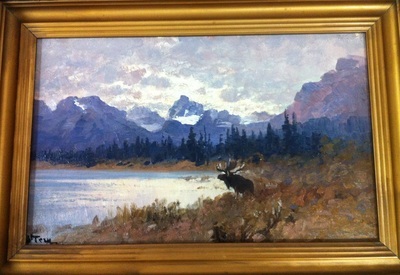 Most of the paintings are in private collections but the Burlington Northern Railway, successor to the Great Northern Railway, has work by Fery in the collection as does the Church of the Latter Day Saints Museum in Salt Lake City. In 1974, an exhibition of his work was held at the Milwaukee Public Library, and in 1975 at the Boise Gallery of Art in Boise, Idaho.